Need labels for your Craft Beer Tap Room Growlers? 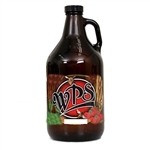 Now you can identify your Growlers with awesome looking labels designed to show-off your beverages. Many states now require tap room growlers to have identifying information from the brewery. Why not do it in style with durable labels? Our pressure-sensitive labels are printed on either white Semi-Gloss paper, white Flexlyte film or Metallized Silver paper label materials and are available with gloss or matte lamination; or gloss or matte UV varnish. Labels come in rolls of 500 and are available only in multiples of 500. Our Price: $198.00 - Per Roll of 500. Order per Roll. Discounts increase per roll. Our Price: $198.45 - Per Roll of 500. Order per Roll. Discounts increase per roll. Our Price: $213.30 - Per Roll of 500. Order per Roll. Discounts increase per roll. Our Price: $220.95 - Per Roll of 500. Order per Roll. Discounts increase per roll. Our Price: $224.10 - Per Roll of 500. Order per Roll. Discounts increase per roll. Our Price: $239.40 - Per Roll of 500. Order per Roll. Discounts increase per roll. Our Price: $250.20 - Per Roll of 500. Order per Roll. Discounts increase per roll. Our Price: $251.55 - Per Roll of 500. Order per Roll. Discounts increase per roll. Our Price: $276.30 - Per Roll of 500. Order per Roll. Discounts increase per roll.